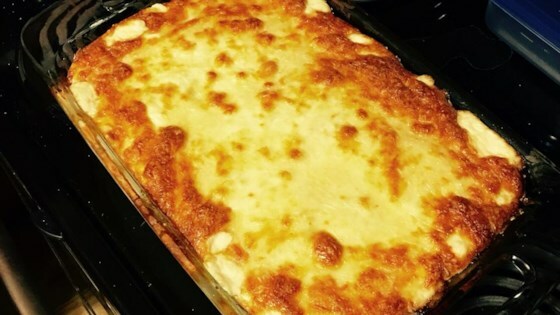 "I made up this recipe because my hubby wanted to try a lasagna made with lobster meat. I combine tender steamed Maine lobster chunks in between pasta, jarred or homemade Alfredo Sauce and fresh spinach and ricotta, Cheddar and Parmesan cheeses. Serve with a tossed garden salad and oven toasted garlic bread." Spread 1 1/2 cups of Alfredo sauce in the bottom of the prepared baking dish. Top with a layer of lasagna noodles. Arrange 1/3 of the lobster meat over the noodles, cover with 1/3 of the ricotta cheese mixture, then 1/3 of the spinach and then another layer of Alfredo sauce. Repeat this process two more times ending with sauce on top. Sprinkle the remainder of the Cheddar, mozzarella and Parmesan cheeses over the top. Give the whole pan a gentle shake to get everything settled in. A bit rich but very good, especially the next day! I couldn't find any lobster so I used salmon, shrimps and crab. Oh my God! This is the bomb!!!! !I made this for my niece's bridal shower and everyone wanted the recipe. I also wrote down the recipe for my niece along with a lasagna pan...I just love it.